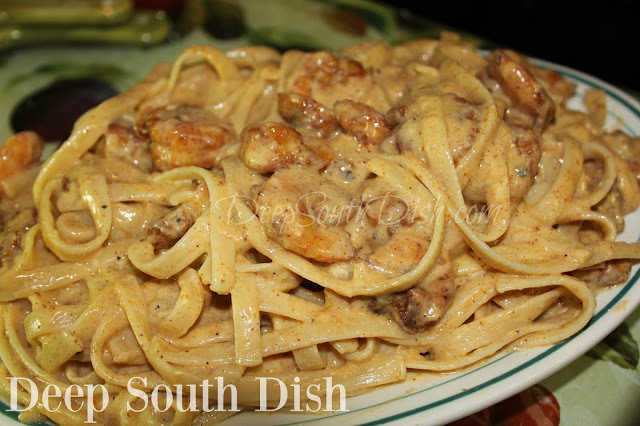 Shrimp Fettuccine Alfredo - highly spiced, sauteed shrimp, tossed in fettuccine noodles and a lighter alfredo sauce, made with 2 percent milk and a quality freshly grated Parmigiano-Reggiano. I don't know too many folks who don't like a rich alfredo sauce. I mean, let's face it. When you go out to a restaurant do you ask for your cream sauces to be made with skim milk? Um, nope. Heavy cream is delicious, though I don't keep it in my fridge all the time, and it's not something I want to consume on a regular basis. I usually only buy it for a very specific recipe. Like holiday mashed potatoes. Custard ice cream. Rich, oyster stew. Or my spicy tomato cream sauce for pasta. Definitely my cream biscuits with the leftovers! I'm not a fan of skim milk though, and not too crazy about 1% either, but I do always have 2% milk in the fridge, and sometimes whole milk, again usually purchased for a specific recipe. Although like anybody else, I love a sauce made with heavy cream, I have discovered that a lower fat milk can still give great flavor and creaminess to an alfredo sauce. When I decided to make this I happened to have shrimp thawed, so that's what I used, but naturally other proteins like chicken breast, ground beef or ham can step in, and it's a great meatless pasta sauce too. Here's how to make it. Prepare fettuccine according to package directions; drain and set aside. Since I had shrimp, and I wanted to bump up the alfredo with some flavor, I brought out some of my favorite seasonings - similar to what I use on my Chicken Lazone and other dishes - chili powder, paprika, cumin, garlic powder, onion powder, salt and Cajun seasoning. Toss shrimp with seasonings until well coated. Heat 1/2 of the oil in a skillet, cooking shrimp in batches until mostly cooked through, about 2-3 minutes per side depending on size of shrimp. Remove and set aside. For the sauce, wipe out skillet and melt butter add flour, cook and stir for 5 minutes. I typically use unsalted butter in most recipes, but had some regular salted butter on hand so that's what I used here. Remember whichever type of butter you use, whether salted or unsalted, consider additional salt you use in any recipe. It's easy to add more, but impossible to take it away! Add garlic cook another minute. Slowly add milk. Whole milk would be fabulous, though I used 2% because that is what I had on hand. Of course, heavy cream would take it over the top! Add seasonings, cook and stir over medium high heat until thickened, about 6 to 8 minutes. If you find the sauce to be too thick, add a little bit of additional milk until it reaches desired consistency. Return shrimp to pan and stir to warm through. The Cajun and I had a gift card for Olive Garden to use so we went there one day for a late lunch. We rarely go out to eat or make it there, so I'd all forgotten about this gadget that they bring right to your table to finely grate fresh, block Parmesan over everything! I said to myself, "Self, you need to get one of those," so I did! You can find them at most kitchen stores, but I picked mine up from where else... Amazon! I always have a block of good Parmesan cheese in the fridge, vacuum sealed in a FoodSaver bag so it stays fresh for a long time. It's come in handy a lot, and I'm using it for other hard cheeses like cheddar too. 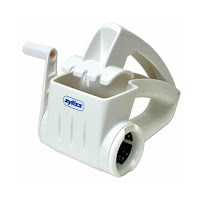 Another handy gadget to have, if you like to garnish with freshly grated hard cheeses. Remove from heat and stir in cheese until incorporated. Serve immediately offering additional cheese at the table. For more of my favorite pasta dishes, visit my page on Pinterest. Prepare fettuccine according to package directions; drain and set aside. Meanwhile, toss shrimp with seasonings until well coated. Heat 1/2 of the oil in a skillet, cooking shrimp in batches until mostly cooked through, about 2-3 minutes per side depending on size of shrimp. Remove and set aside. For the sauce, wipe out skillet and melt butter; add flour, cook and stir for 5 minutes. Add garlic and cook another minute. Slowly add milk, seasonings and nutmeg. Cook and stir over medium high heat until thickened, about 6 to 8 minutes, adding additional milk only if needed to reach desired consistency. Return shrimp to pan and stir to warm through. Remove from heat and stir in cheese until incorporated, then toss in fettuccine. Taste and adjust seasonings as needed. Serve immediately, offering additional cheese at the table. Cook's Notes: Do not use the green, shaker type of pre-shredded Parmesan cheese for this recipe. It contains fillers that will interfere with your sauce. Shred it from a block of good Reggiano. Substitute seasoned and cubed, boneless, skinless chicken breasts, cooked and drain ground beef or cubed baked ham. May also add in a variety of vegetables, including frozen mixed vegetables. Classic Fettuccine Alfredo: Prepare shrimp as above. Increase butter to a full stick and melt in skillet; add garlic. Omit flour. Add 2 cups heavy cream, Cajun and nutmeg and bring up to a near boil, then reduce to a simmer. Beat the yolk of one egg and temper it by adding some of the hot cream a little at a time, set aside. Add pasta and 1 cup of grated Parmesan cheese; toss. Add tempered egg and another cup of Parmesan; toss to coat. Omit salt, but add black pepper to taste. Offer additional Parmesan cheese at the table. I rarely eat alfredo because of the calories but I do love it. This dish takes it to a whole nother level and must be tried at some point. 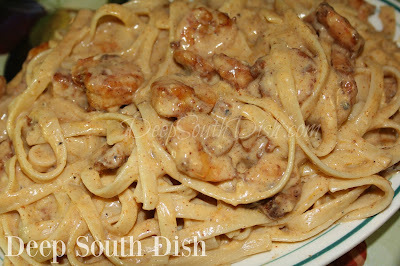 I love pasta dishes and especially Alfredo, this dish looks delish! Only thing is if I make it, I'll have to make it just for me as no one else likes it. I have a low fat recipe that I have made in the past which is not bad but the real thing is so much better. Hope your weather has cooled off. We are going to be in the upper 80's next week. I'm looking forward to it. The humidity has been so smothering. Yes, traditional alfredo is very high in fat - cream, butter & loads of cheese - but mercy it shows it in flavor. If you give this recipe a try, let me know Tricia!! Welcome! Yes, I'm familiar with the Fresh Market & they do have some good stuff!! Unfortunately, I rarely get up and get going to make it down there on Saturday mornings. I like to sleep in. :D We usually buy 50/100 pounds off the docks to put up in the freezer (that's where this came from) but I think I know who you're talking about. I believe I've seen them on Facebook & they have a storefront in Ocean Springs on Government! Thanks so much for sharing that piece of history Ines! Of course, since I am from the southern United States and not Italy, my recipe isn't intended to be anything close to an authentic Italian alfredo, but rather just a basic American sauce. The history of food, however, is always interesting to me, so thanks so much for sharing that! Why can't I find a calorie count for this? It's very good which probably means I don't want to know the count. However, when your trying to maintain a certain weight it's helpful. Hi Tracy! It's probably not as bad as you think, because the amount of butter is significantly less than traditional Alfredo sauce, as is the Parmesan cheese, and I'm using lowfat milk in place of the usual heavy cream, so you're saving quite a few calories. As to calculating nutritional information, I'm just a little recipe blog and not a big site with a test kitchen, so I don't run nutritionals on my recipes. It's just too much additional work and I find that most of the readers aren't looking for that. Mostly folks with diet recipe blogs will provide that information. However, there are plenty of online sources where you can do those calculations yourself.